In today's world of cutthroat competition and market driven economy, every manufacturing unit is facing two foremost challenges. Rising energy cost and urgent need to be "Globally Competitive", not only to grow but even to survive. Daily Unit Consumption (kWh or kVAh) of each & every machines with timings. You will be able to calculate the Shift consumption of each and every machine. Run-Hour & on-Load-hour of your machinery, by knowing the full load (Ampere) the machine takes while production is going on & no load (Ampere) when the machine is running idle. This can help you analyze how much work is been done on that particular machine. This will help you in knowing the electricity consumption incurred in producing a single piece from the machine. Also, you can analyze the efficiency of your machine Operator. Solution is CUMS Multi-Function meter with RS-485 port shall be installed on each machine , these Meters will communicate with our CUMS running on a computer system in the plant .The communication will be done with the help of a 2 core shielded twisted pair wire & a USB to RS-485 converter. The meters will be connected in parallel. 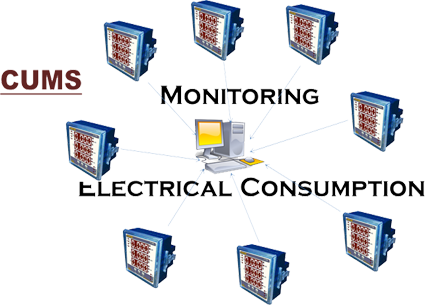 The Yokins’s CUMS (Centralised Usage Monitoring software) will log data from each & every meter installed on the machines. The key features of the software are mentioned below: Logs parameters with date & time stamp. Microsoft office excel worksheet can be generated for any particular desired period . Connectivity indication is always present, you will always know whether the particular machine is connected or not. Scanning time of data can be varied from 1 minute to 1 hour. Special SMS alert facility can be added to basic software for any of the parameters. The software can be customized as per requirement of individual customer, by studying the usage pattern and requirements.